There can never be enough breweries. This is one statement that all my beer loving friends would wholeheartedly agree with. Craft brewing has been exploding for years and like an extended fireworks display I don’t think we’ve seen the best of it yet. In recent weeks I’ve been to Mountain Goat in Richmond, and both Temple Brewing and Foreigner Brewing out Brunswick way. A few days ago I had a Stomping Ground pale ale at Canteen Pizza in Cottesloe on the other side of the country from where it is made in small batches in Collingwood! The latest brewery to land in Richmond (well, the Burnley part at least) is Burnley Brewing on Bridge Road down the Yarra end. After a reasonably extensive renovation of the old Romulus and Remus site, BB took over but kept the R&R kitchen, along with its focus on Italian. I can see BB being very popular. While it lacks a large outdoor space like the Bridge Hotel two doors down, it makes up for it with large windows fronting the street, and a big airy space with high ceilings, as you would expect from a brewery. The renovated room is clean and restrained, with good mixed spaces, and a long bar for the many who will have a drinking preference. Tonight we are checking it out with Catherine’s sister Stephanie, and their Mum, Sandra. While it is an early dinner, there are plenty of punters both having a drink, and getting a bite to eat. 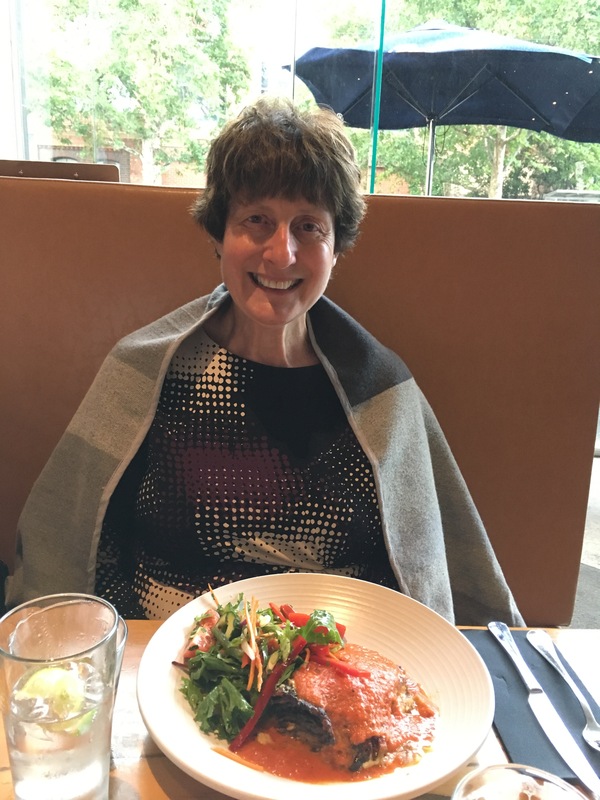 We decide to share some starters and a pizza between three of us, with Sandra opting for the eggplant parmigiano, which she loved. The pizza hasn’t changed here, and it was always good quality, without being amazing. Our capricciosa is a good size, with plenty of topping, and is cooked right. 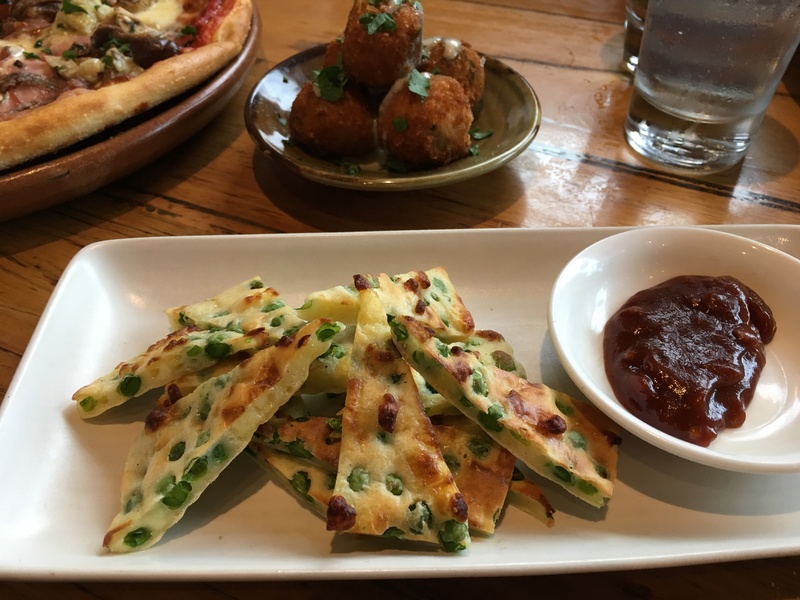 The arancini is great, with a good dose of gorgonzola adding to the saltiness. On the flipside, the pea and haloumi fritters are a little bit weird with not a great amount of flavour. 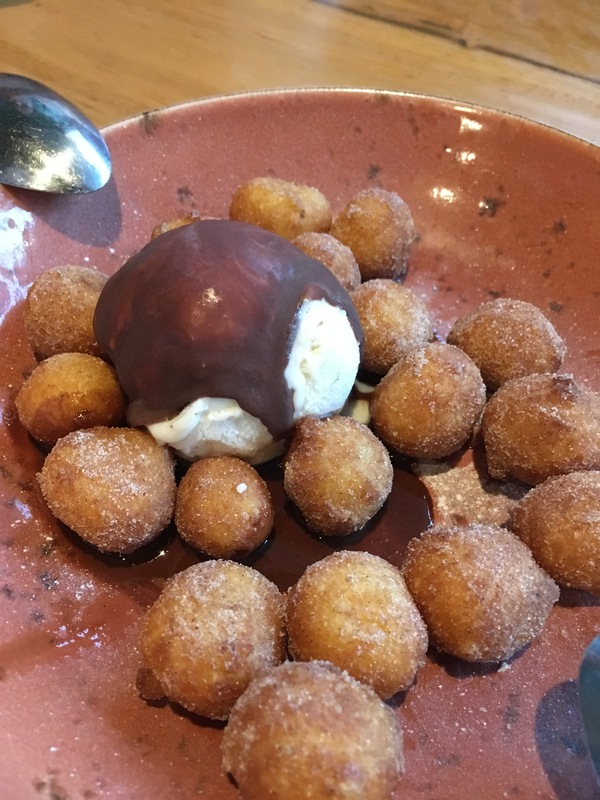 With a little bit of room left, we shared the donuts with chocolate coated vanilla ice cream, which is simple but effective for a shared dessert. More importantly, at this stage I’d tried a couple of the beers, and they are good, with the IPA a little ahead of the pale ale in my opinion. The only disappointment was the double IPA running out, but it should be back early next year. 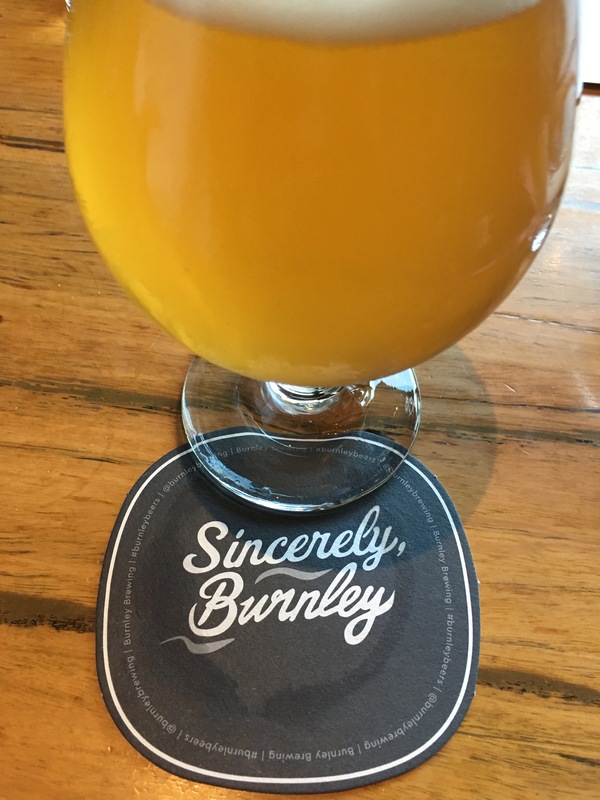 With enthusiastic and energetic service, a comfortable space, and some freshly brewed beers, backed up by a kitchen that has always done a nice job, Burnley Brewing should enjoy plenty of success. Classic should never be interpreted as boring, though in our fast-paced world, it sometimes has a double meaning. Done well, the classics, and classic places, reveal some of our favourite experiences. It is certainly not that I forgot about Cafe Di Stasio. It appears year after year on the list of restaurants I want to go back to. Unfortunately it is a very long list, such is the quality we enjoy in Melbourne. The cliches come thick and fast for touristy St Kilda. It’s one of those places that I’ve always enjoyed, but rarely get to. There isn’t the edginess that Fitzroy has, or the dynamic nature of the city. 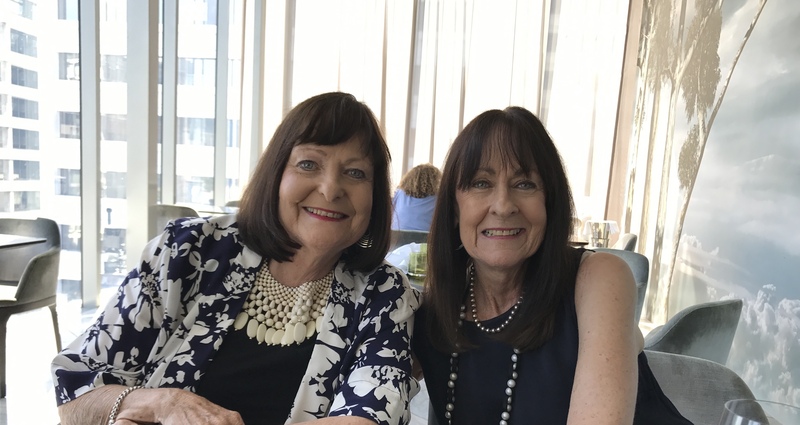 Perhaps it feels too much like the places I grew up in – beachy, safe and friendly like Perth. 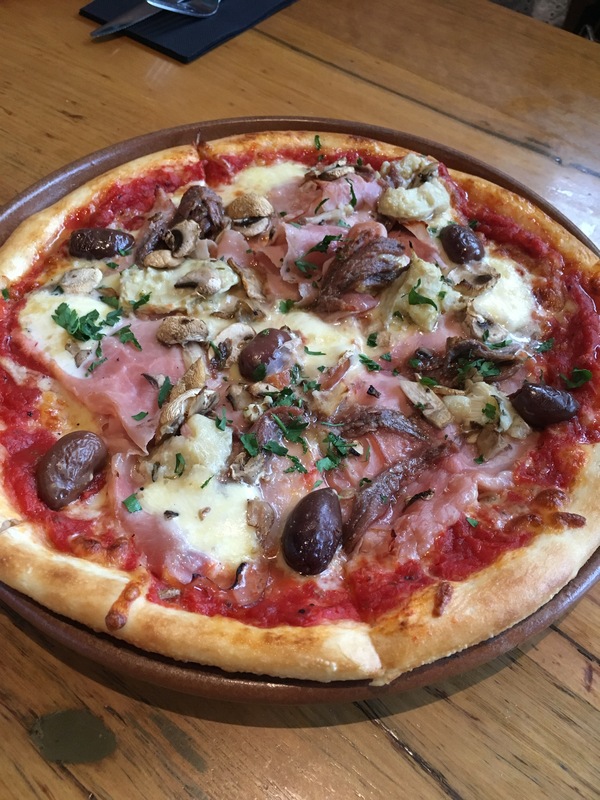 Somehow, in the busiest part of Fitzroy Street, as you walk through the doors of Di Stasio you are transported thousands of miles to an Italian oasis. Yes, there is a St Kilda vibe of calm, but there instead of laid back beach charm, there is the sophisticated charm that only profession and experience can create. If it sounds like I am bubbling with praise for this institution, I am! I’ve been here with groups, and by myself, but tonight it is with Catherine to celebrate the anniversary of our first date. Several years later we really combine well for dinner, knowing each other’s dining habits intimately. By virtue of that understanding, it doesn’t take long for us to agree to share a starter, pasta, main, and dessert. 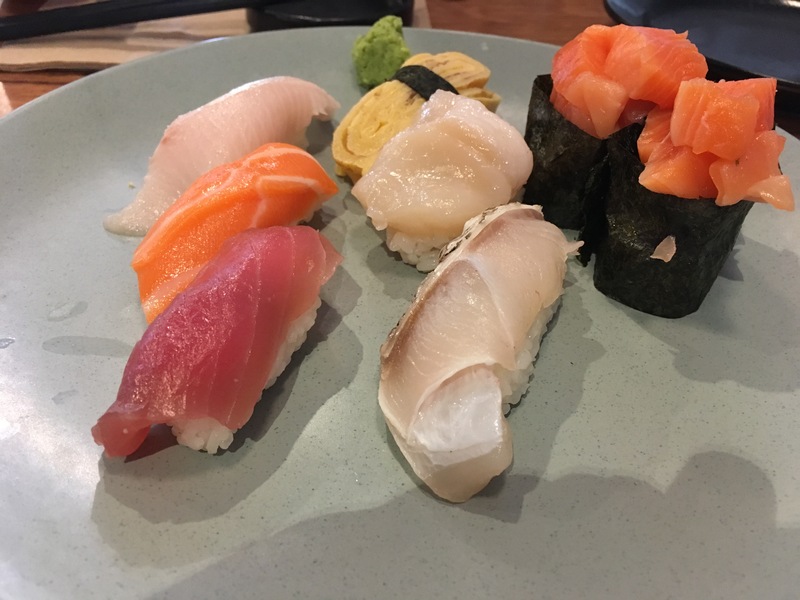 This isn’t for everyone, but too many times people miss the balance between trying several courses and dishes, and feeling uncomfortable at the end of the meal. 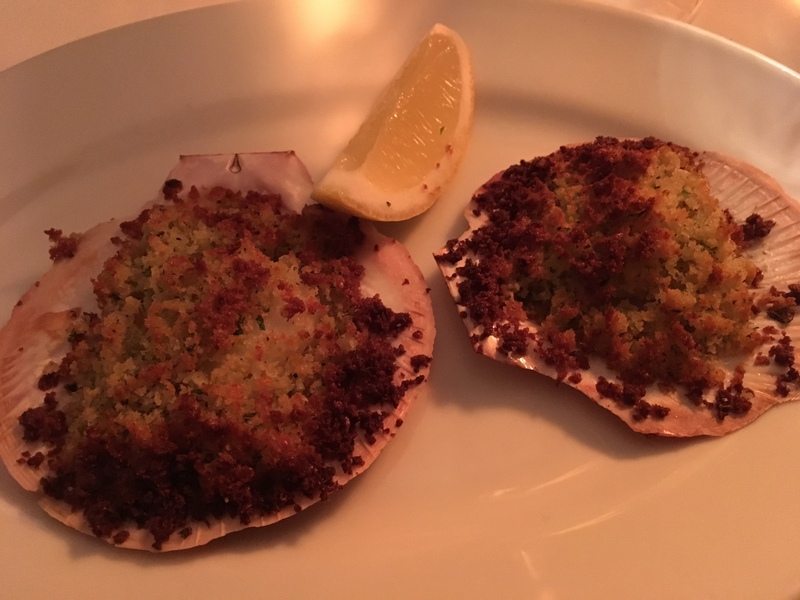 The first dish we select is the scallops baked in their shell, with a simple parmesan crumb. Done well this can be an outstanding dish while on the other hand it can be a good way to ruin a great scallop. Here, it has been done thousands of times and the result is delicious. After a great start we next choose the fresh pasta of the day with a mushroom sauce. 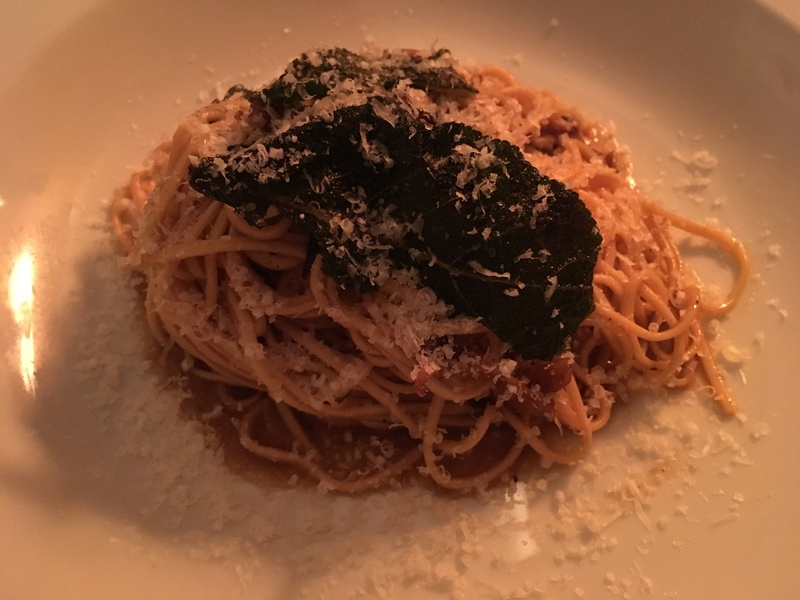 Draped with sage, this is the ultimate of mushroom sauces over a spaghetti that doesn’t get much finer when made fresh, though I wouldn’t have described it as angel hair like the kitchen had. The depth of flavour, without going overboard on seasoning, is exceptional from the first bite to the last. Sharing is not an issue to presentation either; the chefs happy to plate separately without being asked. 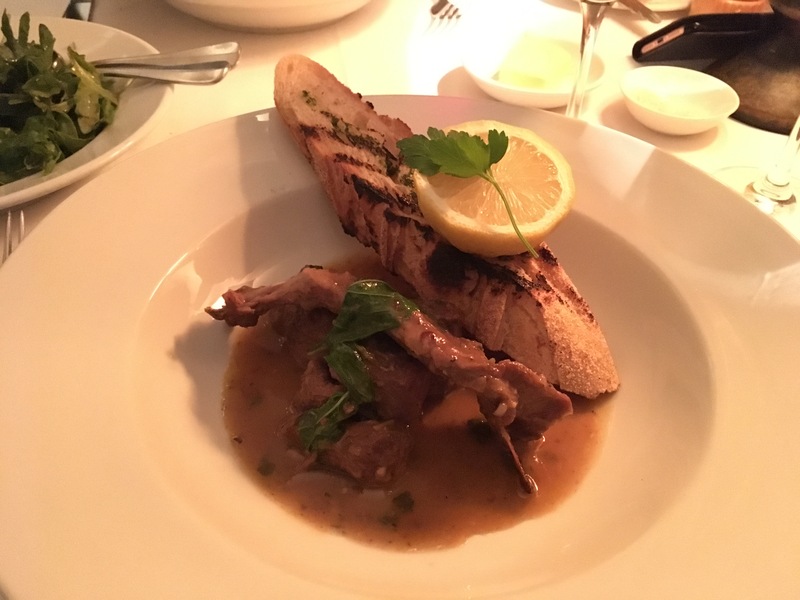 Our love of pasta means our main was never going to top our previous course, but the slow cooked lamb is beautiful anyway. With a generous grilled garlic brushetta to mop up the white wine, anchovy and rosemary sauce, this was a perfect expression of rustic fine dining. Halving the serve (again being plated separately) meant our final tastes were not stretching our stomachs and there was plenty of room for dessert. 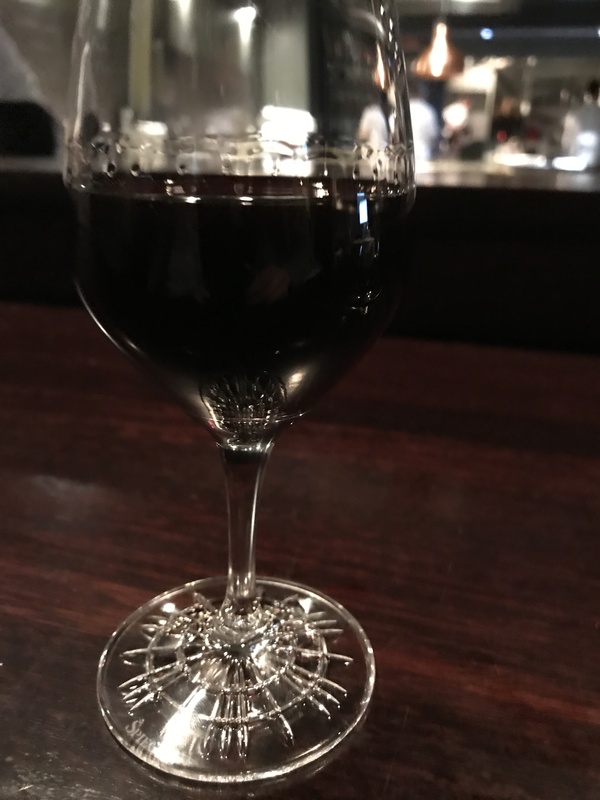 Throughout our meal I enjoyed some well selected wines by the glass, which is expected given Di Stasio has a bar that is as frequented as much as the restaurant. Service had been excellent too. 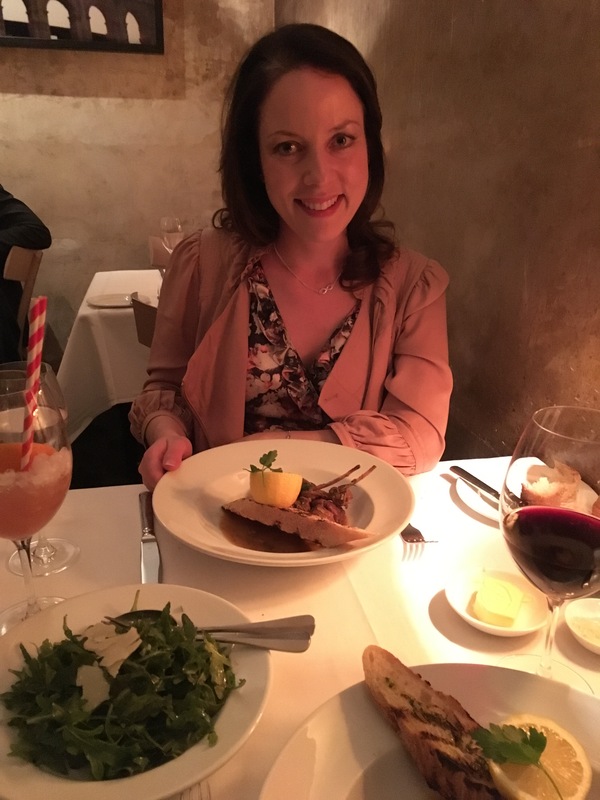 The only exceptions were later in the meal trying to get a red wine before my main arrived, and organising the bill. These are only minor, and had a bit to do with our awkward table position, but still probably shouldn’t happen. 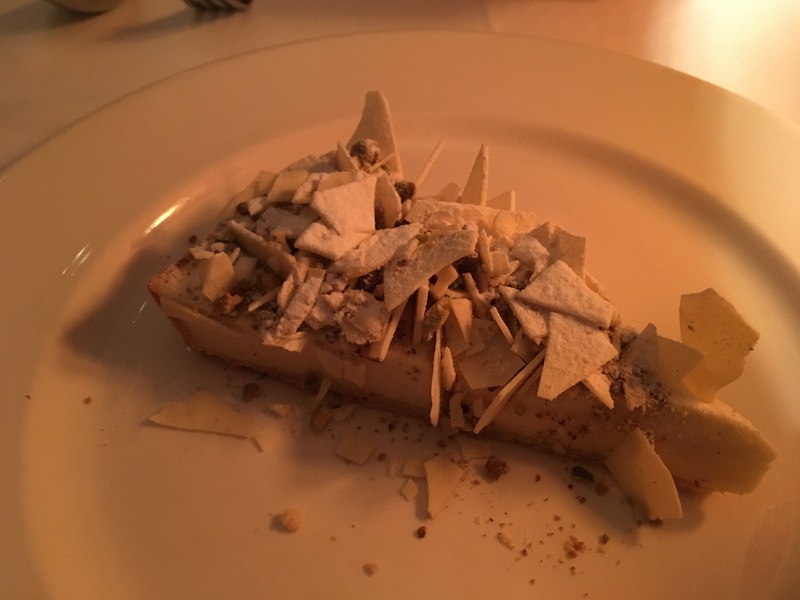 There are some nice sounding desserts, and while none jumped right out at me, Catherine had her eye on the white chocolate and mascarpone tart. 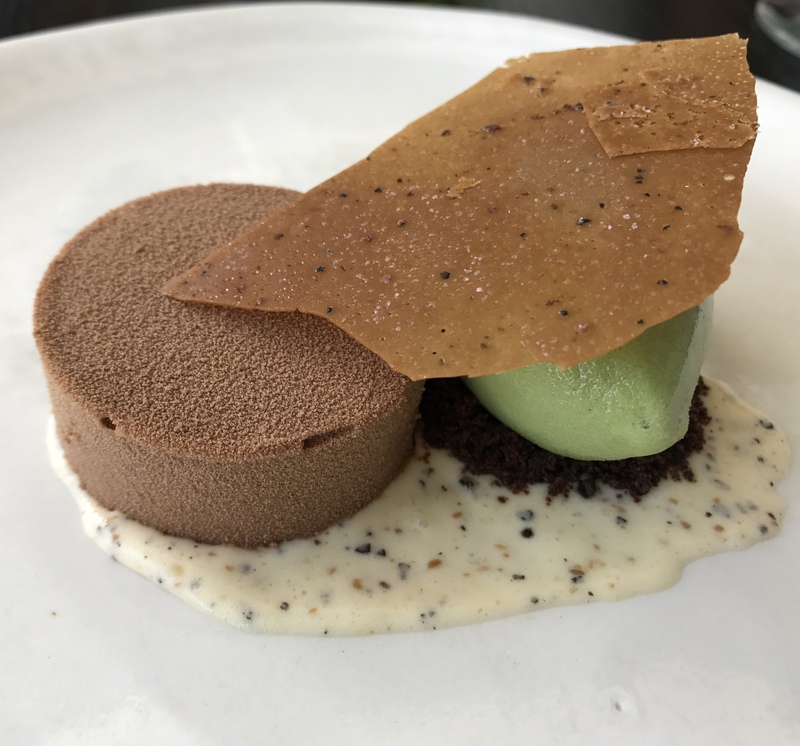 Simple, not “deconstructed”, and full of flavour, I was glad to have tried the tart. 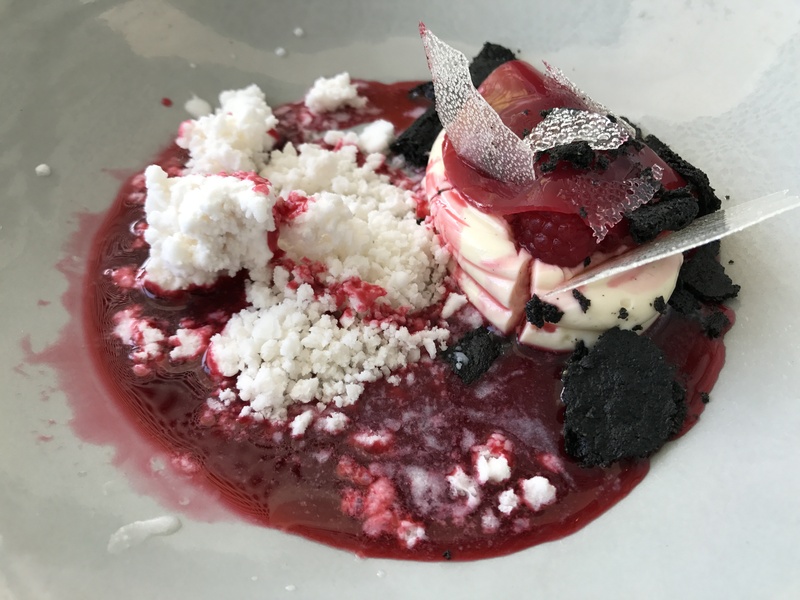 It’s a beautiful dessert, and while rich, it is an excellent way to finish a superb meal. 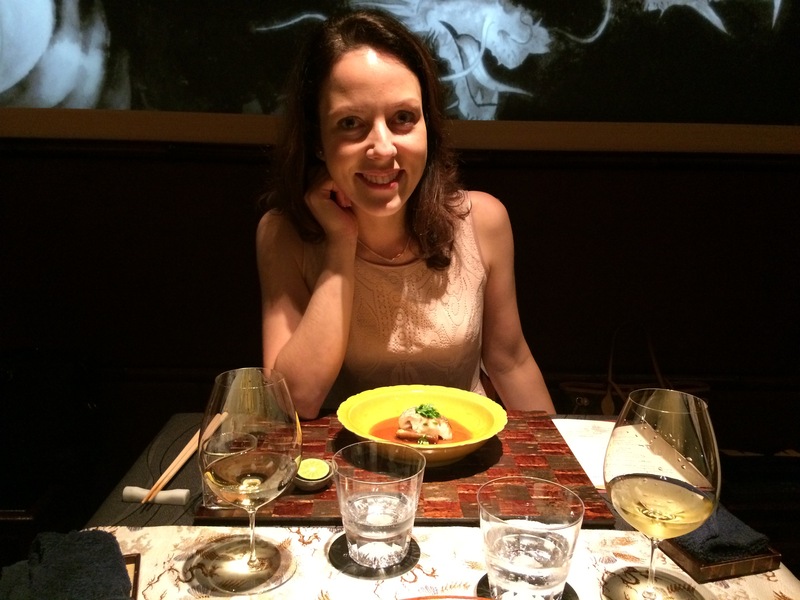 Normally I write about a three star meal in the few days that follow the experience. There is a degree of excitement and anticipation that keeps alive when you get to deeply think about the meal that was. Occasionally, especially on holidays, it is just too hard to find the time. That is not to say a serious delay is a negative measure. After a great meal you have a glow. You can still almost taste some of the most exquisite dishes and smell the scents. Over time you lose many aspects, and those that last are often with you for life. Add in the travel element, and you are much more likely to remember some dining experiences with even more fondness. They are connected to holidays; less stress; more indulgence. The weight of evidence suggests tonight is going to be an experience to behold. Good friends have been here and recommended it, but it wasn’t just them. 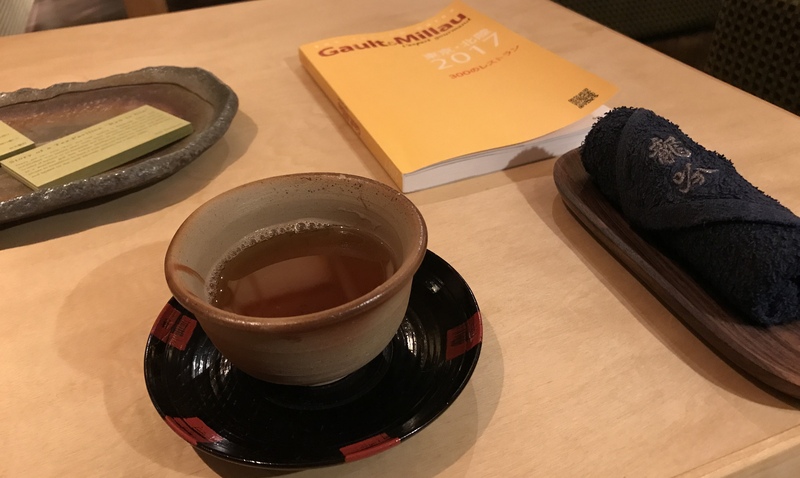 In Tokyo, many restaurants do not accept foreign bookings, so our hotel was responsible for organising our visit to RyuGin. Walking up to the door there is nothing that suggests this is one of the best restaurants in this huge city. As in all Japanese establishments, the welcome is warm and respectful. We are early to make sure there are no hiccups travelling to the quiet part of Roppongi, so we are shown upstairs to wait for our sitting. Funnily enough, with some nice green tea and a splendid room (more on this later) we suggest getting here early is a good idea. Once led into the dining room we realise that the restraint of the entrance is no different here. It is very nice, and there are some dominant features, but it is certainly not elaborate. Given we are in a non-English speaking country we don’t expect to understand everything, but generally the staff deal well with our lack of Japanese. 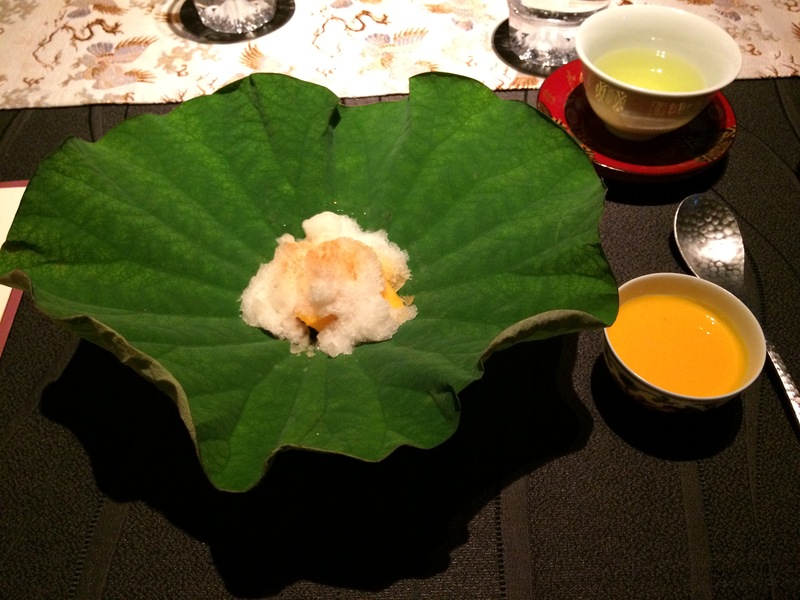 Our first course is sea urchin packaged in crispy batter and seaweed, with broadbean and edamame soup. It is quite sensational. The sea urchin is unrecognisable and brings out softness and that subtle flavour, while the broadbean is beautifully seasoned. The soup is simply stunning. Salt is around the edge of the cup and I can’t stop until it’s gone, continuing to run my finger around the edge for more of that salty hit! The abalone in the second dish is the best I have ever tasted, in a deep cloudy broth with a white paste we’ve seen elsewhere but have no idea what it is. 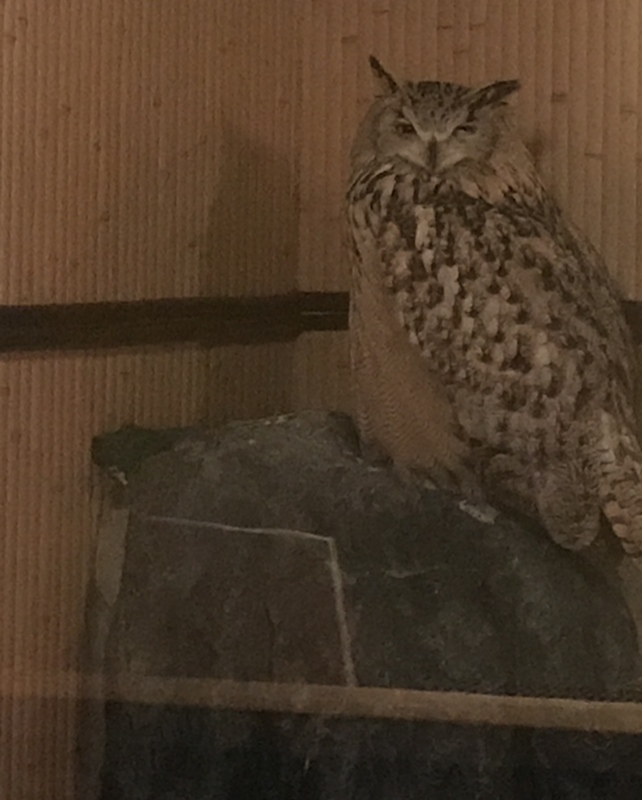 Earlier we had been sitting in the waiting room admiring firstly the gigantic owls and then the video of the head chef’s exploits with cooking amazing produce. The dish we were presented with showed fabulous technique in the form of divine knife skills allowing eel to blossom like a flower. 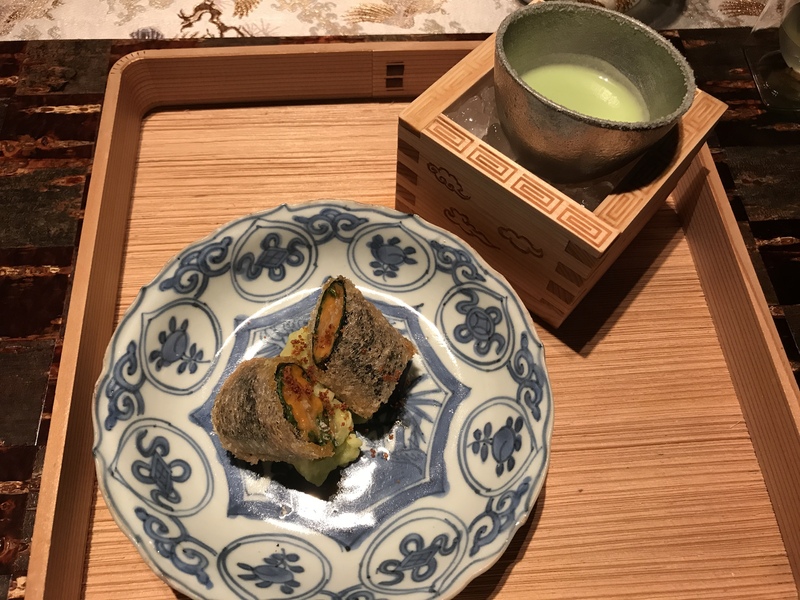 The flavours, especially the broth of Mt Fuji water, and glutinous vegetable scattered throughout, were probably too different to fully appreciate, but it was still a tremendous dish to eat. 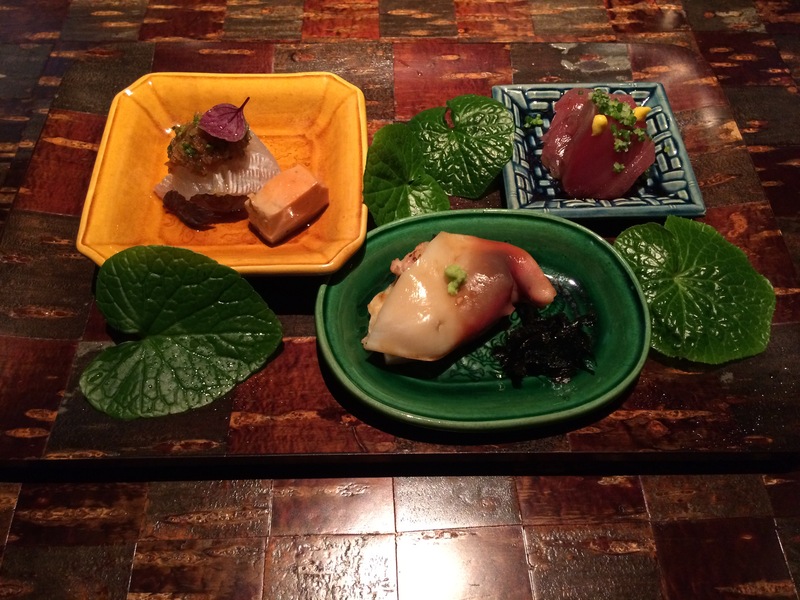 Our sashimi course has challenge, beauty and intrigue. The challenge is the crab which is chewy and not everyone’s cup of tea, but I like it all the same. The Benito is absolutely gorgeous with not one flaw. It is the equal of the ootoro tuna sushi I earlier tried near the fish market as my best fish for the visit. 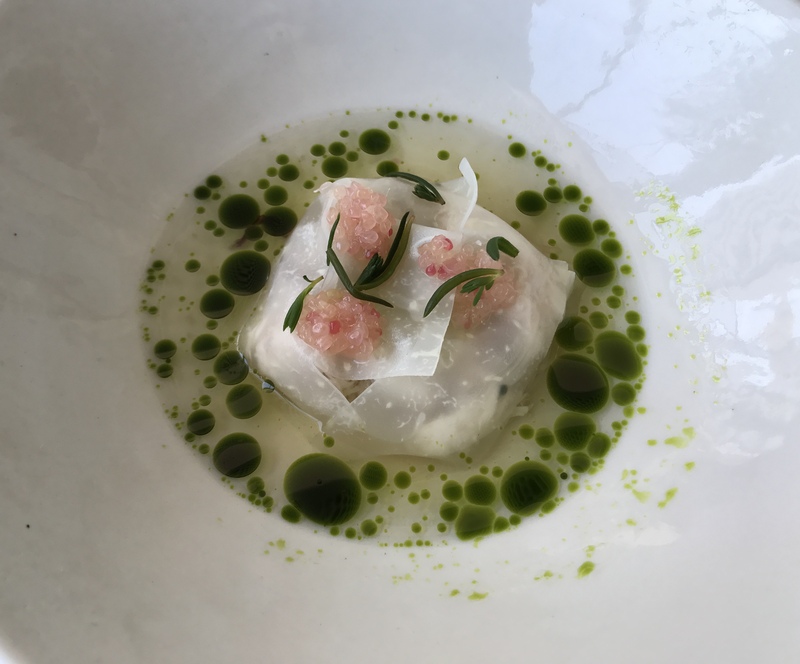 The intrigue is the flat fish which is again a different texture to what you associate with sashimi, but is delightful and beautifully matched to the accompaniments, this one being salsa like. 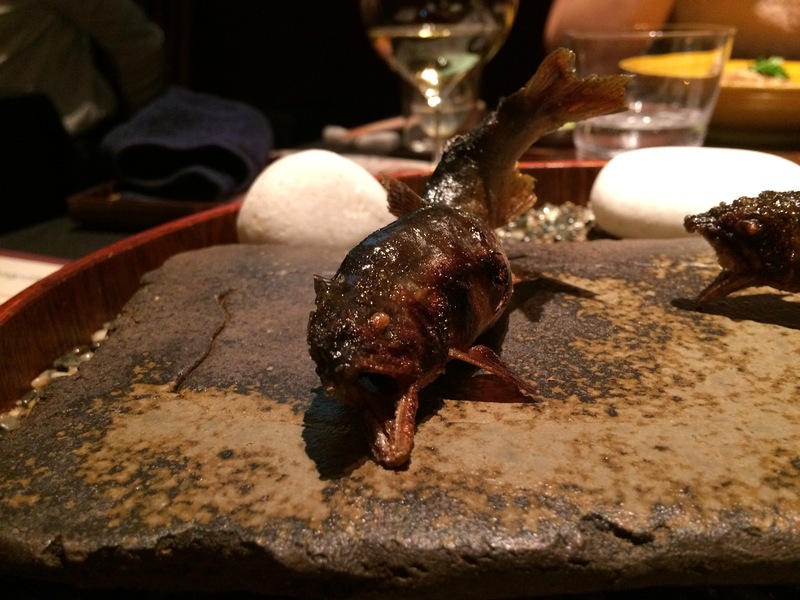 The frightening looking fish, called Ayu is served next in the theatrical style some love and others despise! I love it, the challenge in presentation, and the impact it brings. The instructions given are three bites – one over the head to the wing, the next over the wing, and the last over the tail. Wow, the first bite is scary. Then you taste the impact of the char, reminiscent of great squid or sardines over charcoal in say Portugal. Then you calm and the next bite is delicious and all of a sudden you are dipping into the watermelon based sauce like a pro and absolutely loving it, trying to work out the next time you will eat Ayu again! As Catherine would describe, the first half of our meal is different and confronting. But the second half is basically just awesome. We are almost onto our beef course and we’ve already gone through about $160 on 4 glasses of premier cru Montrachet so spending another $130 on two glasses of red was a stretch but you only live once. If I had a critique it would be that the wine, as sublime as the limited options are, is nevertheless very limited and all very expensive. Finding some glasses to offer that are nice for $30 would really help our wallet! We only had the choice of two reds and both were very expensive by the glass. 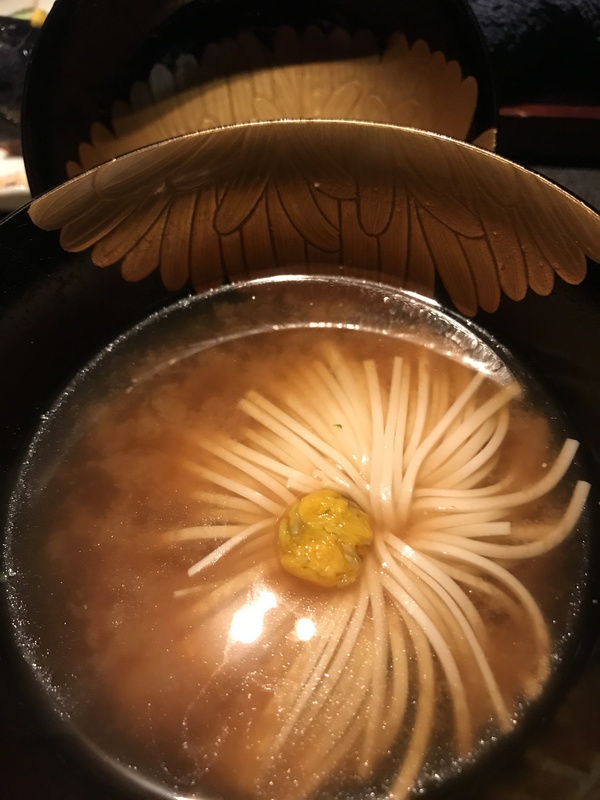 Prior to the beef we had a surprise in the form of noodles and broth, a dense egg yolk sitting atop the noodles, looking very proud, and eating wonderfully. The terrific floor staff directing us to dip the noodles into the broth, which is consistent with the way connoisseurs would eat their noodles here in Japan. The beef course was something to behold. 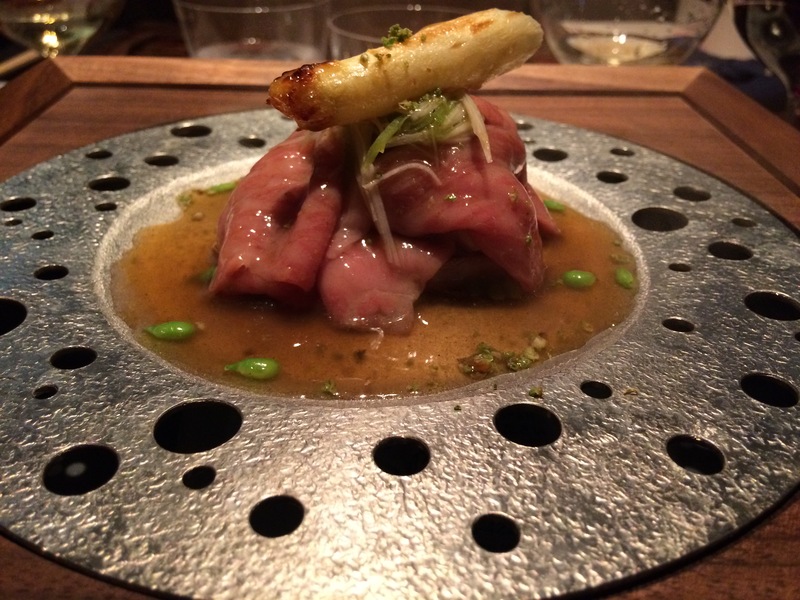 Presented over a steaming contraption, it was completely rare and slowly being cooked above an onion, with a semi-glutinous broth and asparagus. It was so delicious it was gone in a flash, even with trying to have a sip of red between each taste. Left behind, the onion was about as great an onion I’ve eaten. And I never ever finish an entire onion portion. We were really getting into a groove. 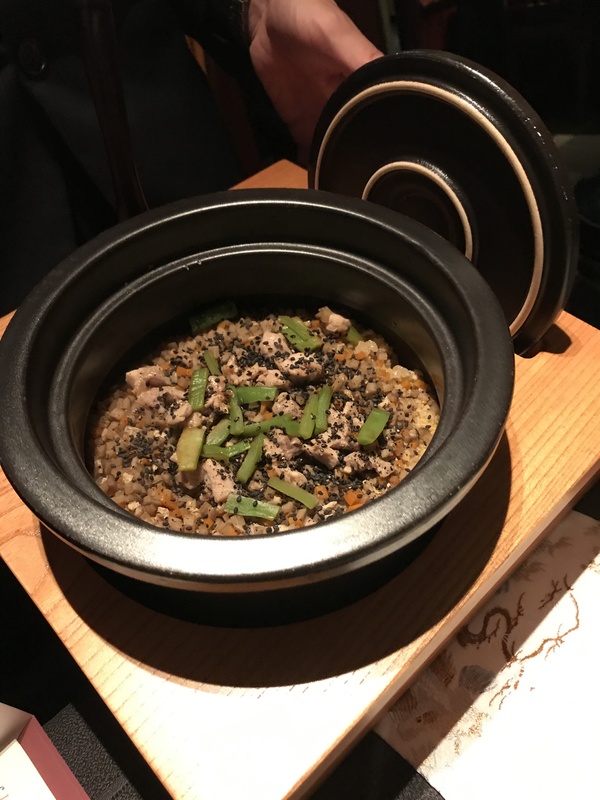 This is thoughtful modern Japanese food and maybe a bit above our abilities, but intriguing and indulgent at the same time. The next course was chicken rice with a miso soup. 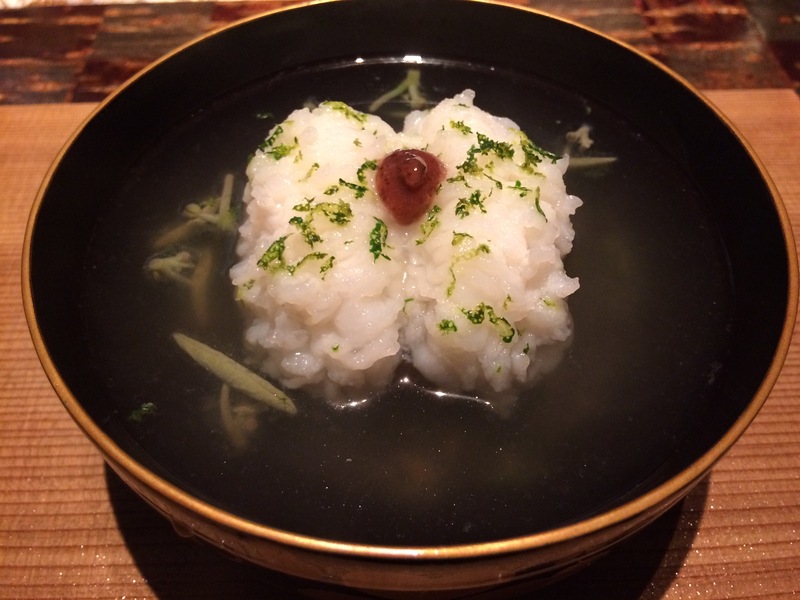 The miso has an ode to the chrysanthemum flower which is a Japanese icon, and you could not believe it is tofu! Not only that, the miso is wonderful. The chicken rice has intricate knife skills being shone on the dish, but the flavour, whilst very nice, is not one of the better profiles of the evening. The chicken is fabulous though. This took us to dessert. Absolutely no offence to Asia, but desserts here are different, and often more savoury than many other cuisines. So imagine our surprise when a deliciously balanced but sweet mango ice dessert with sweet mango concentrate comes to our table. 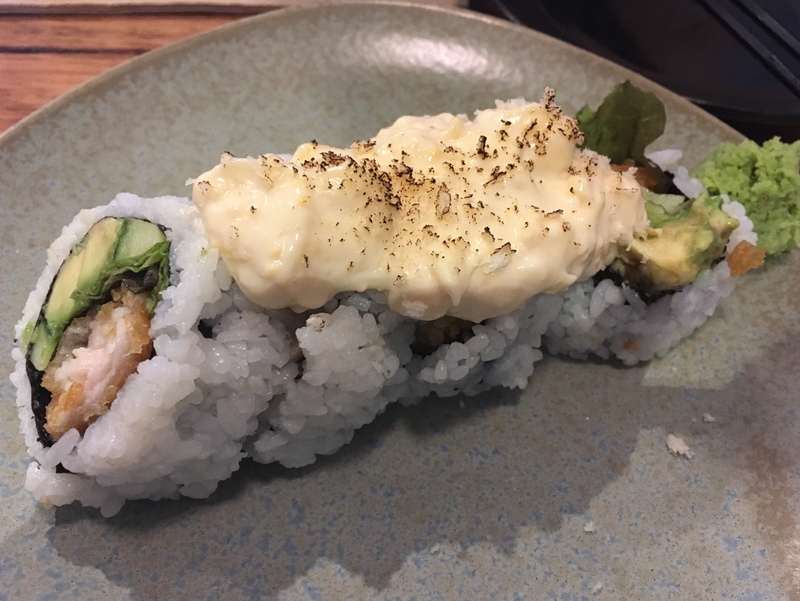 It is hard to describe how good this was, but knowing this combination well, I can honestly say it was the best I’ve ever had, including several goes in Hong Kong. 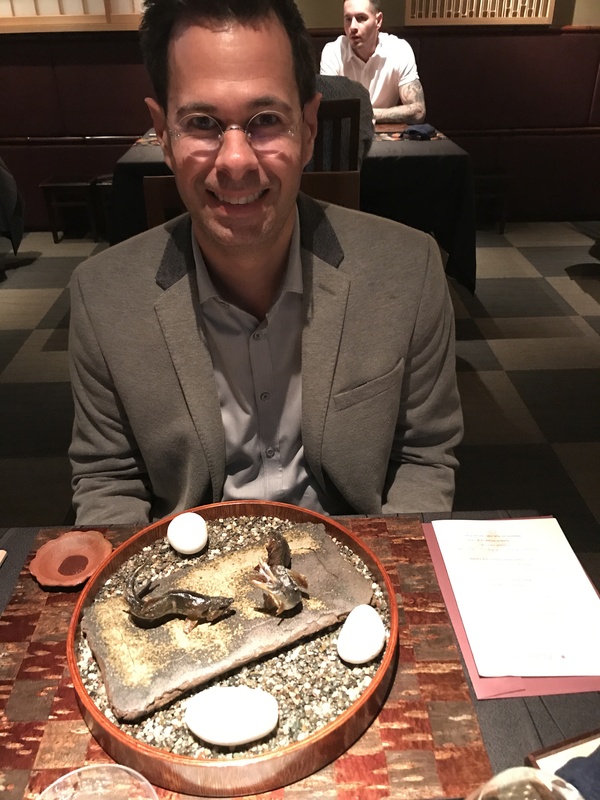 Then to follow up and smack it out of the park comes a double take on sake, leading to me having a double take on how good these desserts were! 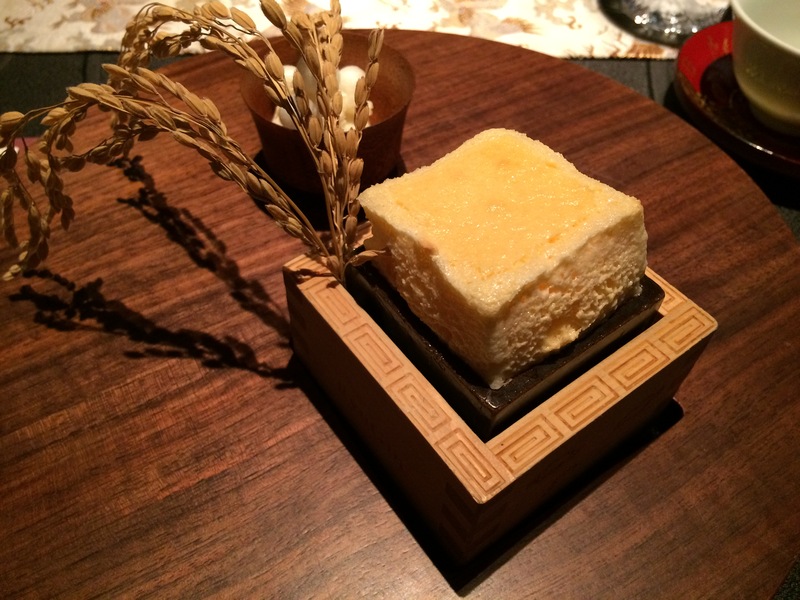 A soufflé of sake and a sake ice cream hit the high notes. The soufflé is perfectly constructed and deep in the vessel, with a textured top, and soft bottom, with just the right balance of egginess. The ice cream keeps its form and actually tastes of the key ingredient. Knowing how difficult it is to achieve this I take my hat off to the chef and his team. We finished with a matcha green tea as the night was ending, reflecting on a second half that was definitely more settling. 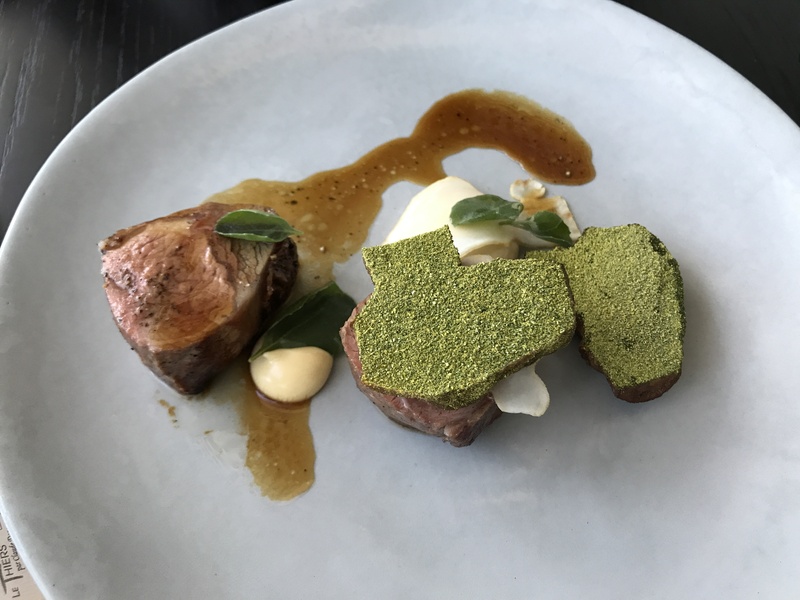 It goes to show that in both Western and Eastern fine dining, being brought to the edge of your tastes by the chef is part of the experience. Sure, it should still be comfortable on the whole, but a few dishes outside your comfort zone brings the meal to an entirely different level. 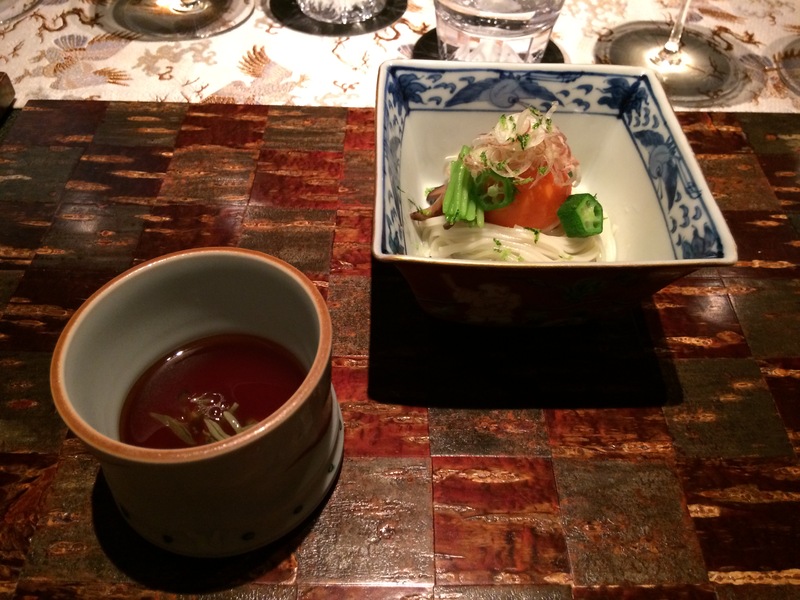 Several months later I look back at our time at RyuGin with fondness and respect. When I reflect on some of the cafes that have opened early on during my time in Melbourne, and realise they’ll be breaking ten years soon, it is a little scary. I associate Three Bags Full with the same vintage as Proud Mary. While I have kept on going back to Three Bags Full, it remains what I would say is an underrated cafe in comparison. This is not to say the owners are struggling with this business. Many years ago it expanded to the premises immediately next door, and it has continued to be full ever since. Besides that, I haven’t notice a huge amount of change. 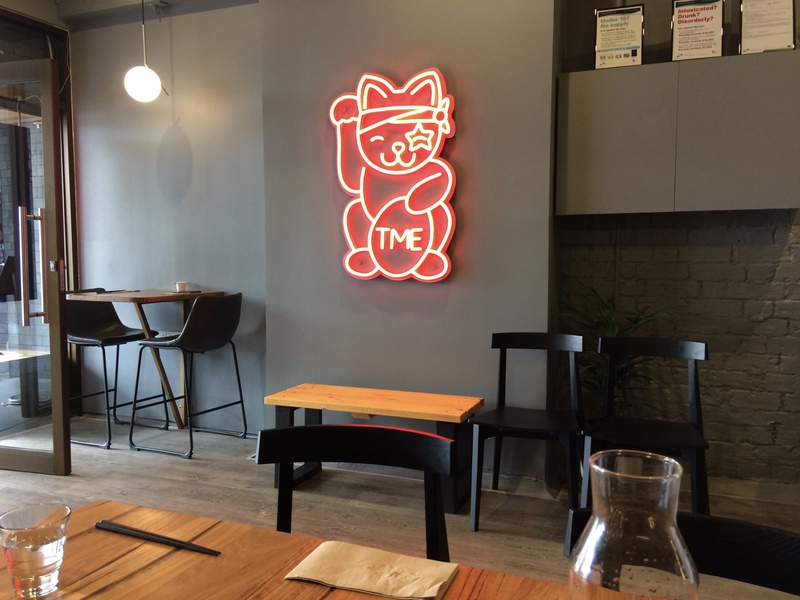 With a great menu, a fashionable vibe, excellent coffee, and knowing staff, why should it? Today the same ingredients that made TBF successful over many years are still going strong. 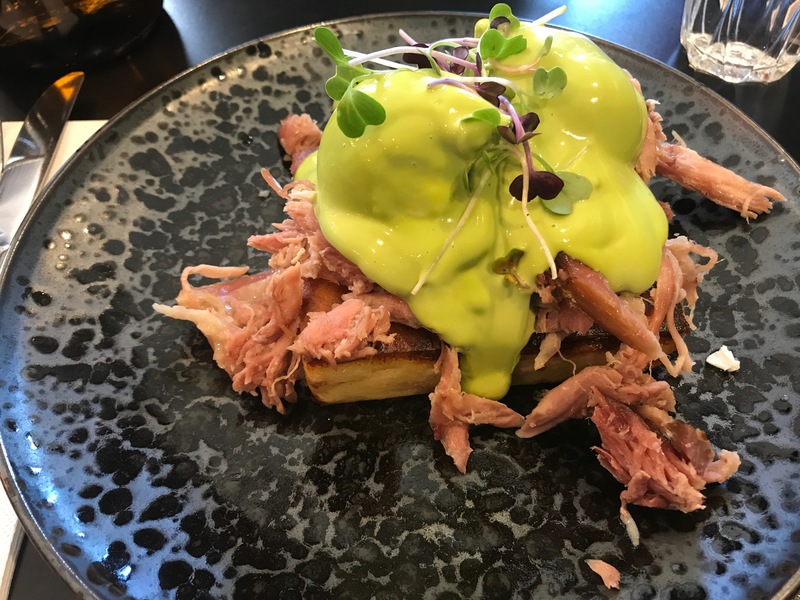 My Benedict with ham hock and green hollandaise over perfectly poached eggs is terrific. 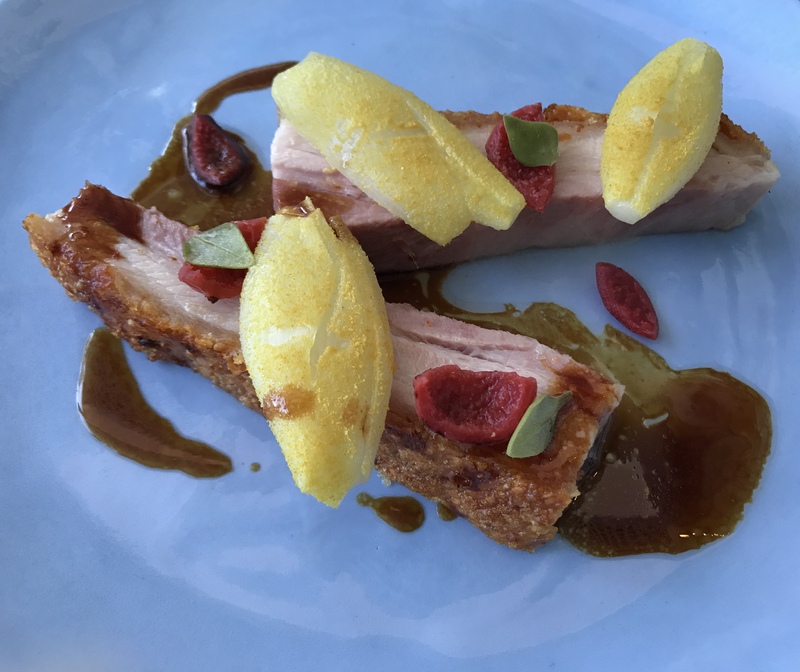 This dish is now quite a modern Melbourne breakfast classic, and this particular one is nicely done. 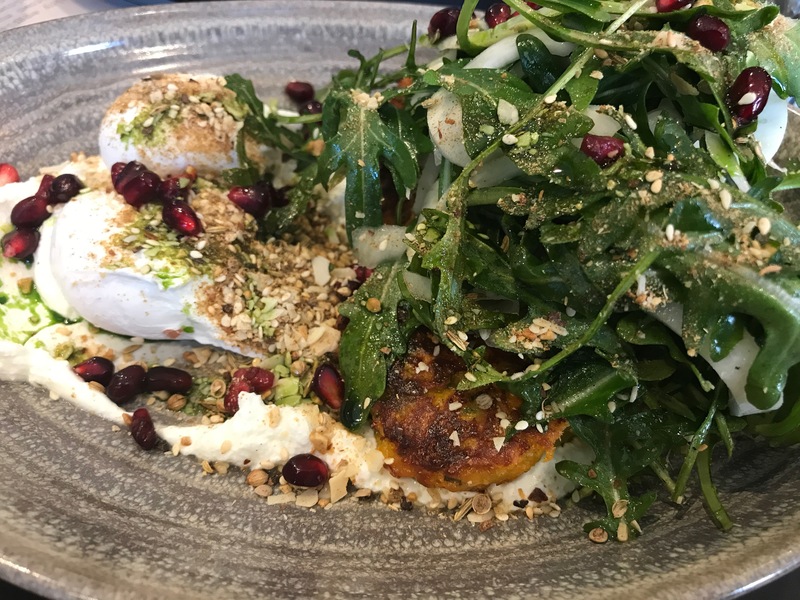 Catherine’s sweet potato and carrot fritters with goats curd, and a fennel and pomegranate salad, are great too. 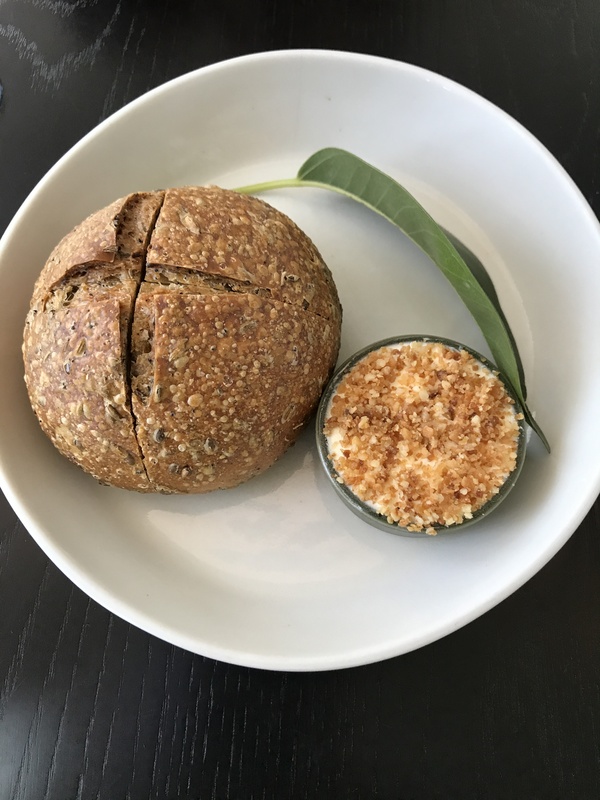 The almond dukkah is not overpowering but adds distinct flavour. The fritters were expertly cooked to the right consistency, and the freshness of the salad added the right amount of zing. TBF is always busy, so as much as we’d prefer the main room of the cafe, we always accept the likelihood we will be in the second room. It is still nicely fitted out, and there is something satisfying about being in a pre-Scandinavian movement cafe, complete with warehouse surrounds in Abbotsford. The only reason we are not here more often is the depth of new, and closer, cafes in our area. But there’s little doubt we will keep coming back from time to time to enjoy the familiarly great offerings here. Time passes by so quickly. 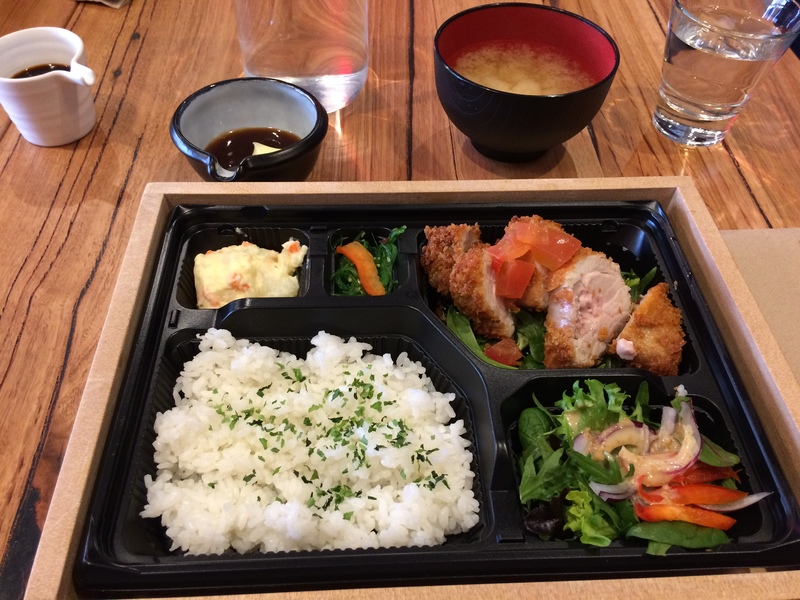 Now almost three months back, Catherine and I had our first experience at Oter since it replaced Yu-U. Across from its sister restaurant, Coda, the space has been thoroughly renovated. The feel is not dramatically different thanks to the large bar focussed seating space, and the fact the restaurant is partially below ground. Back in the Yu-U days it was a little claustrophobic though, but now it is quite open and airy. We are happy to sit at the bar, which seems to be the place to be, not to mention the view of three tarts of the day is close to irresistible! The menu is interesting in its diversity, and the prices are reasonable for some sophisticated dishes. Service is knowledgable and quite attentive, though the whole bar dining concept is a bit confused here with the majority of service coming from the floor, rather than from behind the bar. 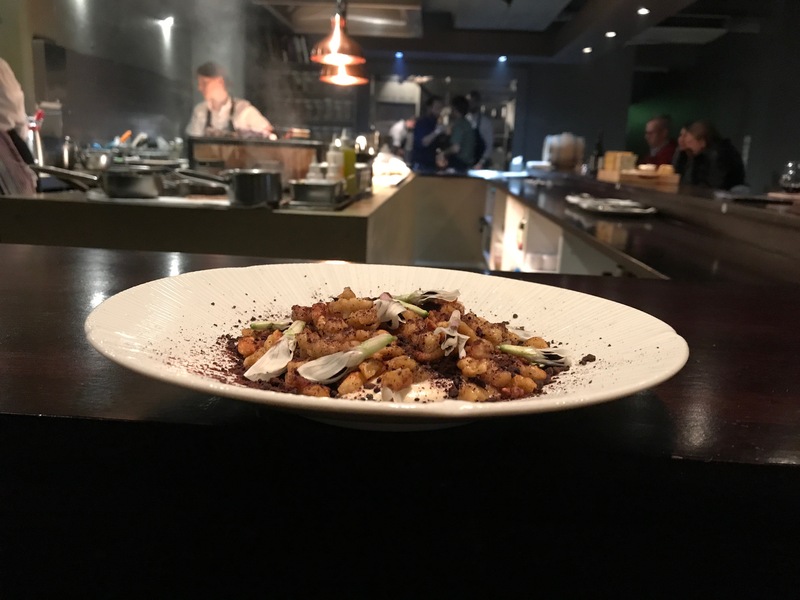 The bar does give the chefs (largely working further back and not right in front of you) the opportunity to present dishes to you, which has a charm to it. 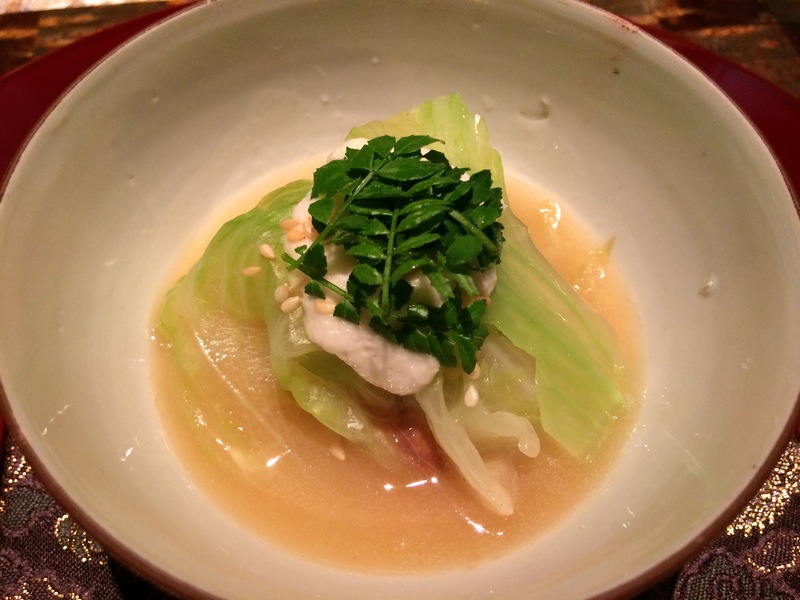 To begin we tried one of the Moulton sea urchin on top of a bundle of kohlrabi noodles. 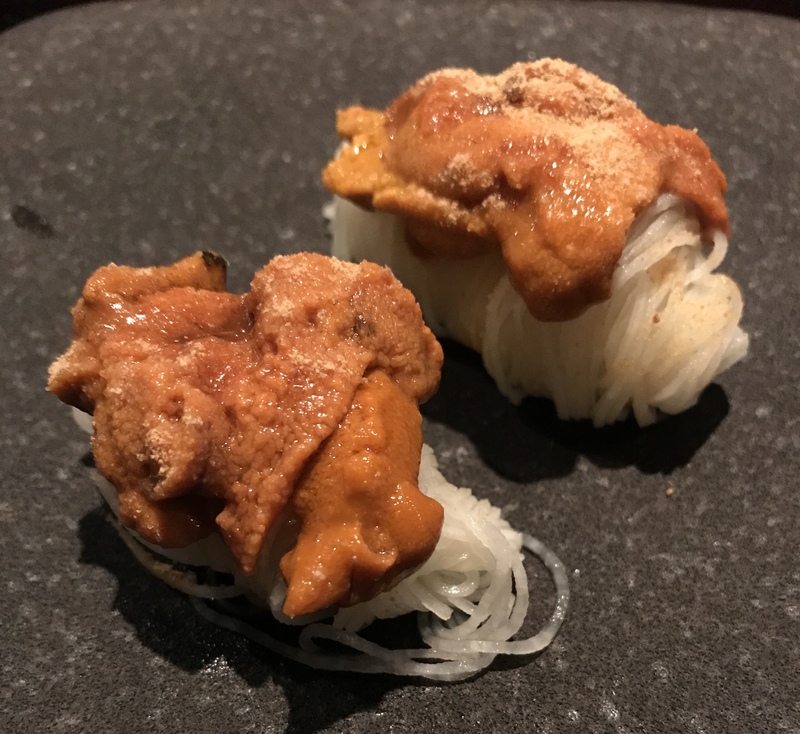 Served cold, the sea urchin has that soft texture that can put people off, but when paired next to the firm vegetable noodles, the subtle flavour was able to show itself off. Next we shared the blue spanner crab with pickled cucumbers and slithered hazelnuts. 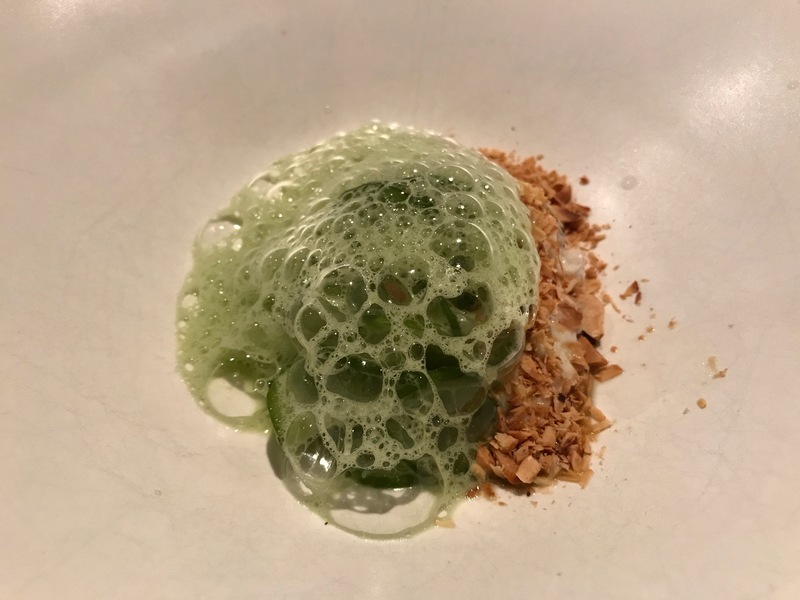 Presented with a cucumber foam, the dish looks delightful, and the flavour is its equal. At this early stage we were growing in excitement for the dishes to come. The wines by the glass have many points of interest. We started off with a champagne by Piper Heidsieck, before moving into a Chardonnay by Salo. I hadn’t heard of Salo before but it is made by two of the best winemakers in the Yarra Valley, as part of a project to make natural wines. As we got towards our mains we chose a Cabernet Franc by Crawford River. All three glasses were fantastic, pointing to a well thought out wine list. We had to ask our waitperson a bit about the Alsatian bread dumplings because they were something we hadn’t encountered. There was just something about bread dumplings, onion sauce, and blood sausage that really piqued our interest. In the end it was a very hearty and satisfying treat prior to our shared mains. We decided on two mains that we would share to avoid any menu envy. 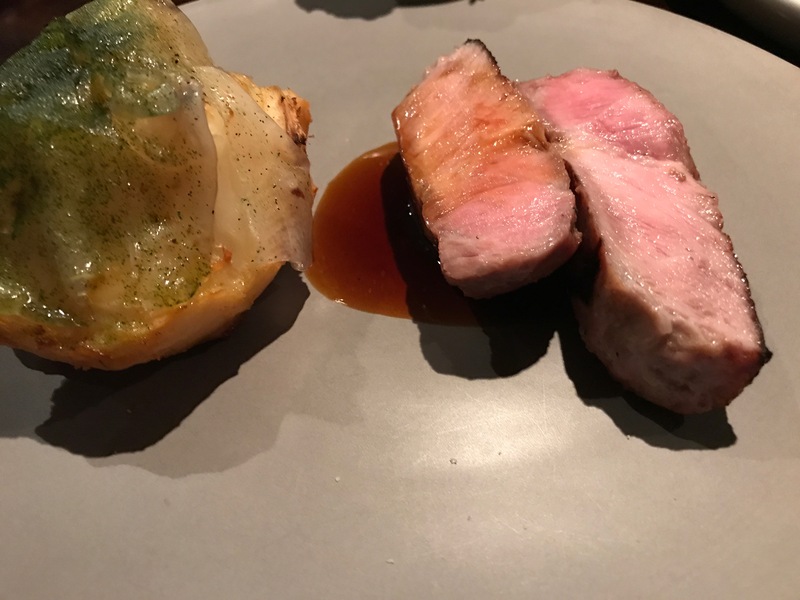 The Kurobuta pork was served perfectly pink, with a whole slow cooked confit celeriac really making its presence felt. 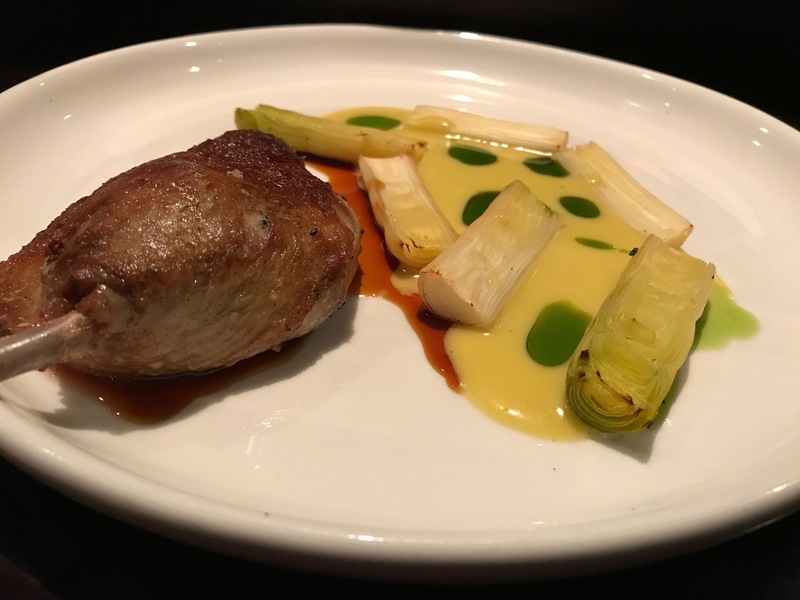 The Gippsland duck was served with a pretty beurre blanc sauce, scattered with charred baby leeks. 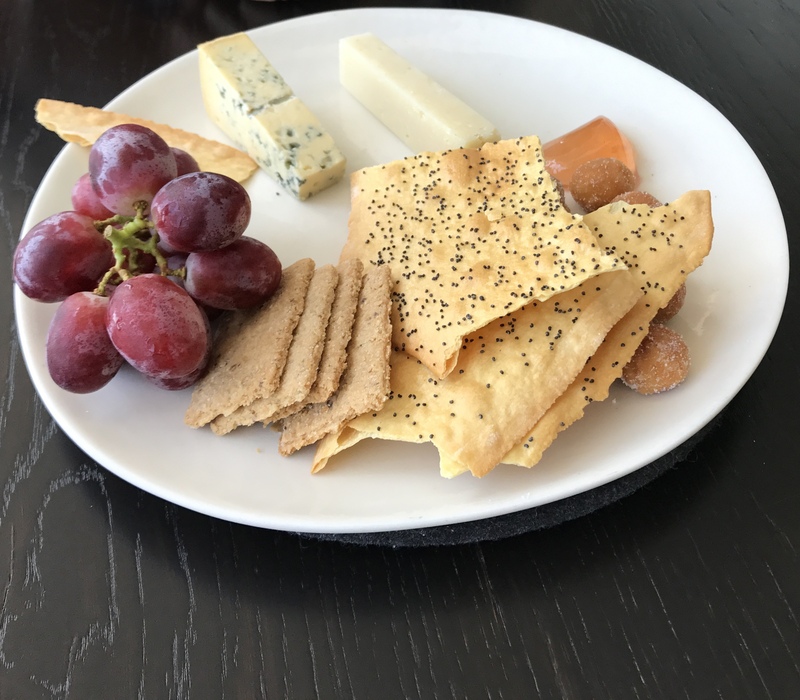 Both were excellent, with some nice contrasting features for us to enjoy while sharing. The pork soft and tender; the duck with that crispy skin around the drumstick, and a more generous sauce. Earlier in the night we were craning our necks to check out the amazing looking tarts of the day. One of the floor staff saw us and instantly brought them closer to us, sitting them on the bar touching distance away (we refrained!) There was no doubt one of us had to order one of those slices of heaven. 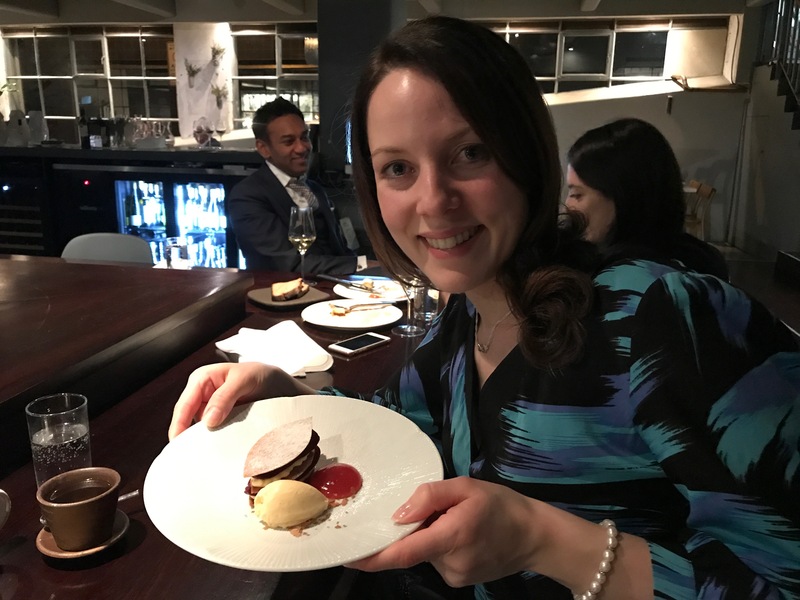 With Catherine keen to try the tamarillo millefeuille, it was up to me to chose a slice, and I went with the chocolate, pistachio and blood orange. 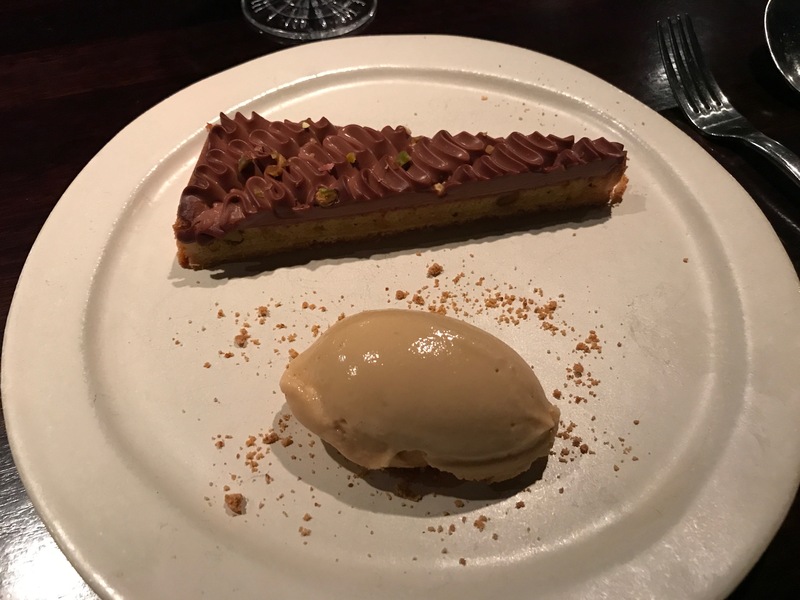 As delicious as the tart turned out, with some reduced milk ice cream accompanying it, the millefeuille won the day for its taste and immaculate presentation. 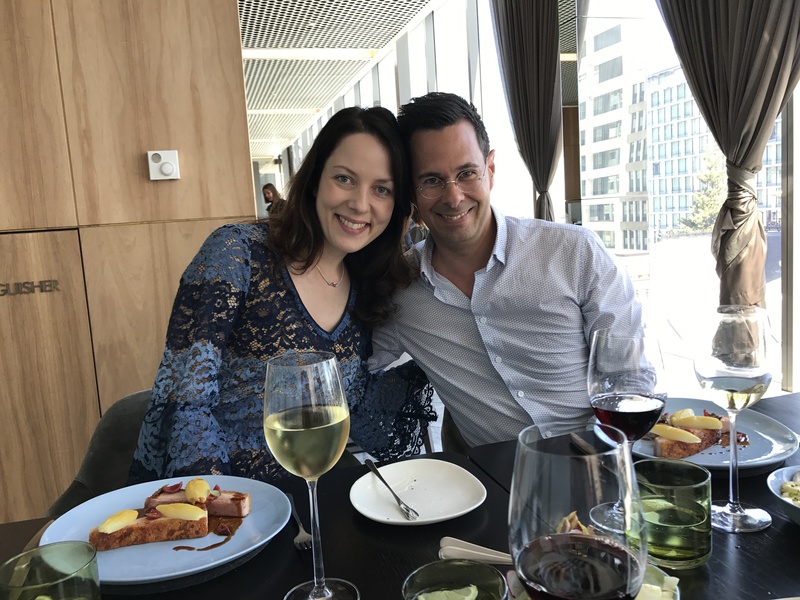 Reflecting on our experience at Oter provides memories of some beautifully executed modern Australian dishes that walk the tightrope between bold rusticity and fine dining pizazz. Eating on the bar is not for everyone, but it is the way modern dining is going. With a few tweaks to give some more life behind the bar, Oter could deliver and even tighter experience. It’s not out of the question to go past just for the tart of the day, but stopping in for several courses like we did is well worth it.